•	Refer AIP SUP H132/18 •	Chart provided for illustrative purposes only. •	Melbourne VTC to be re-issued in May 2019. 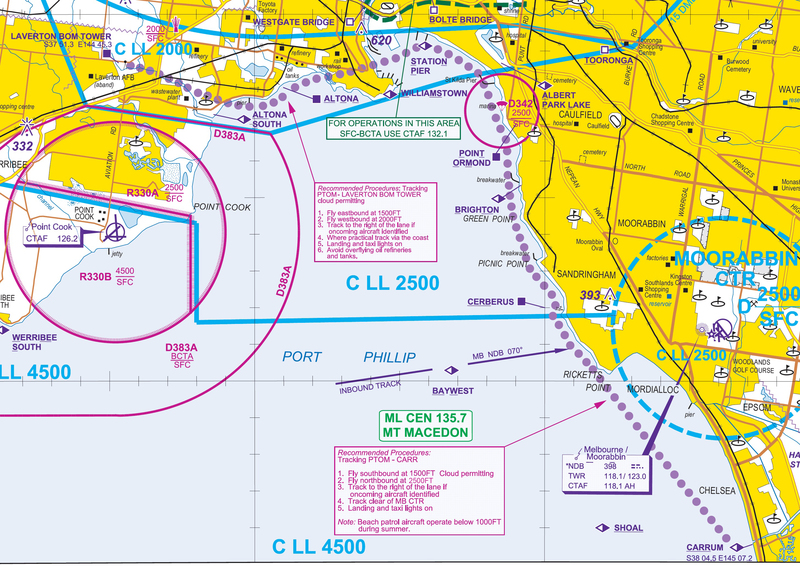 After concerns raised by industry, airspace changes that came into effect on 8 November for the Melbourne Port Philip Bay VFR route have been modified. Class C airspace remains lowered from 2500 feet to 2000 feet under the approach and departure path for Runway 34 at Melbourne Tullamarine airport to accommodate a Category 1 ground-based augmentation system landing system (GLS) approach. 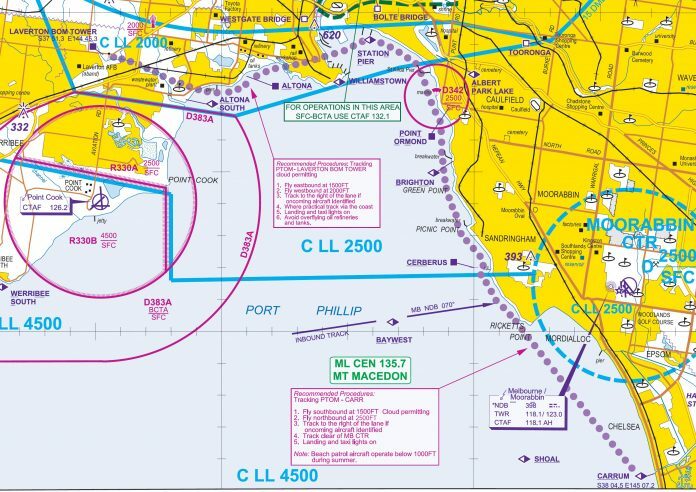 But changes made to the direction and recommended altitudes for VFR pilots flying the coastal route between the Laverton BOM Tower and Carrum, and vice versa have been superseded. Between Point Ormond and Carrum, fly southbound at 1500 feet and northbound at 2500 feet. The changes will take place on 28 November at 0200 AEDT. The arrangements are similar to those in place before 8 November but accommodate the new Class C lower limit. Recently issued charts will not be updated until May, meanwhile pilots must check notams and the AIP supplement before every flight. Amazing!! Us pilots would get crucified if we stuffed it up yet the law makers can’t get it right themselves? unbelievable but not surprised! So we now have oncoming traffic at the same altitude if we are entering YMMB from Carrum? The changes announced yesterday revert the coastal route procedures near Carrum back to those in place before 8 November this year, and which have been flown safely for some time. Unfortunately, this debacle was totally predictable. If regulators do not consult with users, then bad decisions are the likely outcome. In addition, it was always a stupid idea – and downright dangerous – to switch the directions and altitudes, increasing the risk of head on collisions. So my new so my brand new charts are now, not only outdated, but incredibly dangerous as they are the exact opposite to the new (and what had always been logical) new rules..? Incredible amount of reliance being put solely on every single pilot reading their NOTAMs with regards to this change.. Imagine if they dangerously complied with their newest VTC instead! Oz Runways has taken the unprecedented step to modify the Melbourne VTC Inset to reflect the SUP changes..
Is there any proposal afoot to re-print the maps immediately and provide free replacement maps for those who did the right thing and updated their maps to reflect the initial change? Perhaps that should be considered – as part of the cost of what was always a poor decision. If this is not done, then the officials responsible for the initial failure to consult may end up with blood on their hands.